Allies to the Raven Cult and La Corona del Sexto Sol, the Black Ghost Nation is a confederation of Plains Indians located in the Northwest territories and dedicated to reclaiming their land by any means necessary. Founded by the Lakota warrior Burning Arrow, the Black Ghost Nation serves Deadlands as a darker and more powerful extension of Wodziwob’s Ghost Dance prophecies. Although not as apocalyptically evil as the Ravenites or La Corona, the Black Ghost Nation will emerge as a major antagonist as the Regulators continue their journey Westward. In 1860, a young Itázipčho warrior named Burning Arrow (Wahínkpéiléya) performed a Sun Dance at the Black Canyon Medicine Rocks, “piercing his heart” and hanging from the lodge until the bone hooks tore through his chest. During this time, Burning Arrow received a vision, seeing a great serpent rising from the West. As the monstrous snake towered above the Sierra Nevadas, the entire Pacific coast shattered into pieces, and the shadow of the serpent fell across the land. Wherever that shadow twisted, the white men on either side fell to murdering each other, unleashing a tide of blood that washed across the earth. With mounting horror, Burning Arrow saw the advance of the murderous washíchus, and witnessed as countless Indians were driven from their ancestral homes and slaughtered wholesale by the white men. Soon, the entirety of the continent was covered with these white men, who had transformed into locusts as they stripped the land down to bare rock. Not entirely bereft of hope, the vision revealed three “sacred dominions” that the white man could not destroy—the Sioux hunting grounds, the territories belonging to the Comanche and Kiowa, and the beautiful deserts of the Apache and Navajo. Angered by these untouchable dominions, the white men called down a giant hawk, its talons made from iron rails, its beak cast from shattered cannons, and its body feathered with broken treaties. Everywhere this hawk landed, white locusts swarmed from its feathers like clouds of lice, and its battle-cry rent the sky like a deafening steam whistle. Eyes ablaze with stars and madness, the monster tore the heart and sinews from the land with ferocious savagery. As his vision neared its conclusion, Burning Arrow felt his soul enter into the great serpent. Calling upon its divine power, he seized the white man’s raptor within his fanged jaws and dragged it to the earth, his serpentine coils wrapping around the hawk until he crushed the last breath from its broken body. Stunned by the power and intensity of his vision, Burning Arrow struggled to make sense of what he had seen, and as he traveled the plains he gathered a following of young warriors who began to view him as a prophet. Supported by his growing band, Burning Arrow warred against the white men, soon earning his group the name “Shikshichela,” or “Bad Ones of a Different Kind.” Turning away from the more peaceful ways of the Itázipčho—or as the white men called them, “Sans Arcs”—Burning Arrow and his warriors dedicated themselves to purging the white men from their ancestral lands. It wasn’t until 1863 that Burning Arrow finally understood his vision, hearing tales of the Great Quake and learning of the white man’s Civil War. Returning to the site of his Sun Dance, Burning Arrow performed another Wiwányang Wachípi. During this ritual, he offered Wakhán T’hánka a “scarlet robe,” cutting over fifty pieces of flesh from his arms and dancing for three days and nights in a trance. During his dance, Burning Arrow was visited by a powerful spirit, an “associate god” from the South who appeared as a Feathered Serpent. During this second vision, the Feathered Serpent showed Burning Arrow visions of a future where the red men were beaten down, diminished, and eventually exterminated. Only when the Sun turned black could the white man be vanquished, as thousands of Indian ghosts rose from the earth and cast the washíchus back to Europe. The young prophet was told to seek a Susquehanna shaman named Raven and a Paiute medicine man named Wodziwob. After a few years spent consolidating his Shikshichela, in 1866 Burning Arrow found Raven, and together they shared many pipes and talked a great deal over the fire. They agreed that the white man must be beaten, and both shared their visions. Agreeing to an alliance, Burning Arrow returned to the northwest, and Raven returned to Indian country. Over the next few years, Burning Arrow continued to have visions, pointing out to his Shikshichela exactly when and where these “ghost rock” earthquakes would occur. As he built a following around himself, he absorbed ideas from the many tribes that joined his group—mostly Lakota and Cheyenne, but some Arapahoe as well. In late 1868, he finally learned about the Paiute named Wodziwob, who was said to have experienced similar visions on a mountain in Nevada. Upon hearing the whites sent Custer “Long Hair” into their scared lands to scout the Yellowstone for the coming railroad, Burning Arrow decided that the time had finally come to act. Gathering at the site of Custer’s 1868 “victory” at Washita, Burning Arrow and his three most trusted medicine men performed a “Black Sun Dance,” held during the winter solstice of 1873. There, they performed rituals of human sacrifice, dedicating the hearts of captured white cavalry officers to the Feathered Serpent. In the dance that followed, all four Indians were tethered to the same pole, cords attached to hooks in their backs and their minds reeling with powerful medicine. They shared a common vision, witnessing the Sun turning black and the stars falling from the sky. Where each star struck the earth, Black Ghosts emerged—the spirits of dead Indians, which then joined forces with the living to cleanse the land of the white man for once and for all. At the end of the vision, each dancer accepted a symbolic feather from the Serpent, a token of tremendous medicine that bestowed great and terrible powers upon each of the four men. The next day, Burning Arrow declared himself Chief Snake Biting Hawk (Zuzécha Chetányakhtáka), and together with his Three Black Medicine Men, he set about organizing the Black Ghost Nation. The Black Ghost Nation is a confederation of Indians who have embraced the ways of Snake Biting Hawk, and by extension, Raven and Wodziwob. Numbering around 2500, they are composed of a wide variety of tribes, and include Lakota, Santee, Cheyenne, Arapahoe, and even a few Crow and Pawnees, the traditional enemies of the Sioux. Once an Indian accepts his destiny as a Black Ghost Warrior, he is “untribed” and becomes Shikshichela; and unless directly attacked by another Indian, can no longer war against anyone except the washíchus and traitorous Indians whom have allied with the whites. The Black Ghost Nation still worship Wakhán T’hánka, but believe the time has come to preserve the Great Spirit from the evils of the white man, whose “bad medicine” threatens the entire world. They believe that the Great Spirit has sent two holy messengers to earth in this time of need, the Raven Spirit and the Feathered Serpent. The Susquehanna shaman known as Raven is acknowledged to speak for Raven and the Coyote Confederation, while Chief Snake Biting Hawk is recognized to speak for the Feathered Serpent and the Northwestern territories. Wodziwob of the Paiute is also respectfully given his due, but his increasingly more peaceful message does not mark him as a true prophet. The Black Ghost Nation believes that the white man must be removed from the Indian lands of the west. They understand that this will be a long and difficult process, requiring much patience, perseverance, and strategic maneuvering. Unlike their brothers in the Raven Cult, the Black Ghost Nation recognizes that the washíchus cannot be completely driven from America—their goal is to cripple the white man’s power and halt their relentless expansion, rolling back their control over the remaining Indian heartlands. The east is seen as already lost; indeed, the Black Ghost Nation believes the Iroquois and other eastern tribes are hopelessly compromised, and barely recognize them as blood comrades. The Black Ghost Nation has set goals that are potentially achievable, and fights to obtain sovereignty in the “Three Red Nations.” These being (1) a Plains Indian Confederation that centers on the Sioux Nation and comprises most of Montana, Wyoming, and the Dakotas; (2) a Coyote Confederation that occupies all of Indian Territory and parts of Kansas and Texas; and (3) a Navajo Nation in the Southwest that includes the Paiute, Hopi, and Pueblo Indians. Once these Three Red Nations are established, the red man can finally negotiate with the white man from a position of strength. The Black Ghost Nation believes the white man must be fought on all fronts—the military, the spiritual, and the magical. The Black Ghost Nation embraces “total war” against the whites. There is no such thing as a “non-combatant”—every white man, woman, and child may be considered an enemy. Lacking in numbers and military technology, the Black Ghost Nation relies on the tactics of guerrilla warfare and terrorism. They do not adhere to the Old Ways, and seek to arm themselves with firearms, explosives, and even artillery. Although they are not precisely a theocracy, there is little room for metaphysical doubt in the Black Ghost Nation. All who follow Chief Snake Biting Hawk must profess belief that the Feathered Serpent is the warrior aspect of Wakhán T’hánka, and must obey the Three Black Medicine Men. Human sacrifice—whites only—is seen as a valuable tool, repaying the land in blood for what the white man stole. Once the Sun has drunk enough washíchu blood, it will turn black, the stars will fall, and the Black Ghosts will rise. There is no troubling modernity among the Black Ghost Nation. They inherently embrace a world of magic, and their shamans daily perform acts that would be called miraculous by whites. More than any other tribe, the Black Ghost Nation have mastered medicine powers, and they nearly rival the lost Anasazi in their abilities. Using the old Ghost Roads, they may cross great distances in the wink of an eye, their warriors can vanish from sight and reappear at will, and their medicine men can force their enemies see things that simply don’t exist. Their power grows daily, and if the Black Ghost Nation lacks the theatrical flair of La Corona del Sexto Sol, their medicine men are nearly as talented as the brujos of El Coronel. 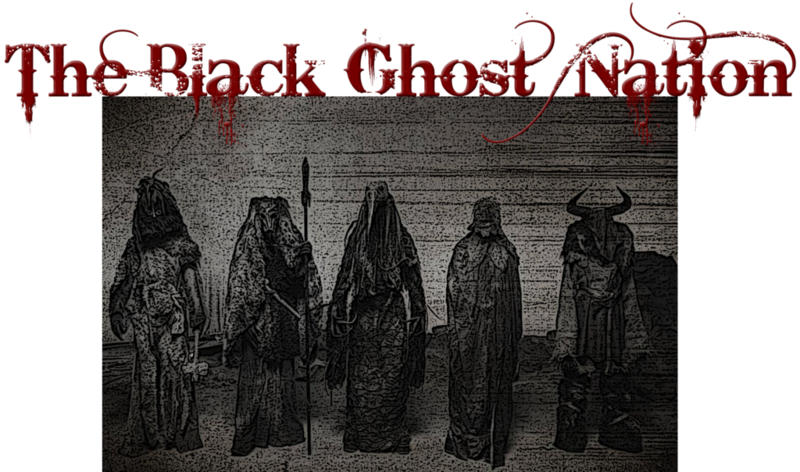 The Black Ghost Nation is over 2500 strong and growing daily. Chief Snake Biting Hawk is their undisputed great chief and wichásha wakhán, and is served by his Three Black Medicine Men and his Ghost Council, a group of seven powerful Shikshichela who advise the chief and carry out his orders. The bulk of the Nation is divided into “Stars,” each lead by a chief who reports directly to Snake Biting Hawk. These Stars are named after Lakota astronomical features, such as Th’ayámni Shingte (Sirius), Th’ayámni Tuchúhu (Rigel), and so on. Each Star is divided into seven “Fires,” foundational groups of 20-60 Shikshichela men, women, and children. The Ghost Council is responsible for forming new Stars, and takes care to disrupt old tribal allegiances and rivalries—like a Deadlands version of the Night’s Watch from Game of Thrones, the concept of being “untribed” is very important, and all Shikshichela are brothers and sisters. There are currently seven Stars, but the explosive growth of the Nation has made expansion necessary, and two additional Stars are to be added at the Great Sun Dance in August 1876. Most of the following Shikshichela personalities are detailed more fully in their own NPC profiles. The undisputed leader of the Black Ghost Nation is Chief Snake Biting Hawk, formerly Burning Arrow. His word is law, but he is no tyrant, and pays close attention to the advice of his Three Black Medicine Men, his Ghost Council, and his two wives, identical twin sisters named Black Snake Woman and White Snake Woman. Chief Snake Biting Hawk is served by Three Black Medicine Men, all of whom participated in the Black Sun Dance and shared his Third Vision. They are Wichákhpi Okhíchamina, Howakhán, and Minninnewah. With a name that roughly translates as “Black Meteor Shower,” this powerful Itázipčho shaman is a wizened old soothsayer. Totally blind, the shaman “sees” with the assistance of his two grandsons, who rarely leave his side. Chief Snake Biting Hawk makes no important decision unless he has first consulted with Wichákhpi Okhíchamina. A Cheyenne berdache, “Whirlwind” is the youngest confidant of Snake Biting Hawk, but possibly the most powerful shaman in the Black Ghost Nation. He has control over the weather, can predict the future during moments of great pleasure or pain, and has been known to converse with animals. Minninnewah is responsible for arranging powerful marriages among the Black Ghost Nation. A devotée of the trickster Coyote, “Speaks with Mighty Voice” is an Itázipčho medicine man skilled in the arts of concealment and deception, and is always eager to bloody his hands in physical combat. He presides over the Sun Dances undertaken by the most important Shikshichela warriors, and is considered the spiritual leader of the Crazy Dog war society. There are seven advisors who make up Chief Snake Biting Hawk’s Ghost Council, an eclectic collection of men and woman with a varied portfolio of powers. Named after a monster from Sioux legend, “Double-Faced Woman” is a beautiful maiden who claims to have been born from the waters of Medicine Lake itself. A very powerful shaman of no distinct or known tribe, she keeps the back of her head concealed at all time, giving credence to the legend that the Wínyan Núpa has a face on the back of her head—a face that may slay a man with just one glance. She is also fluent in twenty Indian dialects, from Seneca to Navajo. A mysterious Itázipcho warrior who joined the Raven Cult, “Shadow of the Hawk” was assigned to the Black Ghost Nation by Raven himself, and acts as liaison between the two groups. Fluent in English and Spanish, Chetánnaghi is fairly “westernized” in appearance. He favors a buckskin coat, carries a Spanish Remington, and speaks with a Texan drawl. A Cheyenne hetaneman, or female berdache, the young warrior “Waterfall” dresses like a man, has three wives, and is as fierce as any male warrior. A brilliant strategist, Immookalee commands the Skull Dancers, and despite harboring a personal rivalry with Chanowíchakte, puts the needs of the Shikshichela above her not-inconsiderable pride. A Itázipčho heyókha, Sing-Down-The-Sky is the leader of the Cheshká Máza war society. Dressed as an Agency policeman, Sing-Down-The-Sky believes himself already dead, and performs all his actions in this strange “afterlife,” an existence that will conclude when his “living” brothers join him under the Black Sun. A dark and mysterious medicine man from the Hopi tribe, “Coyote” is an apocalyptic shaman who was cast out of his tribe for incessantly preaching for war against the white man. He is a lycanthrope, a were-coyote who leads the Black Spiral Dancers, and serves the Black Ghost Nation as a liaison with the Southwestern tribes—who are too often unreceptive to Snake Biting Hawk’s overtures. A Minneconjou who was raised by white missionaries before joining the 7th Cavalry, John Crowkiller turned against his adopted people and joined the Black Ghost Nation after the Battle of Washita. Fluent in English, his advice about the white man and his treacherous ways is indispensable. A Hunkpapa warrior, “Stolen Gun” is a brutal killer who serves as Snake Biting Hawk’s chief of police. An Itázipcho woman, “Left-Handed Widow” is the leader of the Chatka Sapa Society, the female brigade in charge of torturing, mutilating, and finishing off wounded enemies. While most of the women, children, and elderly Shikshichela Indians may be treated as un-skilled Extras, standard Black Ghost warriors have the following stats. AGL d8, SMT d6, SPT d6, STR d8, VIG d8, PAR 7, TGH 6. Archery d10, Counting Coup d8, Fighting d10, Notice d6, Riding d10, Shooting d8, Throw d8, Tracking d6, Stealth d8, Survival d8. Attack: Trapdoor Springfields, Cal .45-70, Range 60/600/1200, Cap 1, RoF 1/2, DAM 2D8; Bow & Arrow, 1d6+d8 STR; War clubs, knives, & tomahawks, 1d6+d8 STR. Black Ghost warriors differ widely in terms of dress, body paint, and armament, and particularly favor adorning themselves with trophies collected from white men—Army greatcoats, hats, and scalps are common. In general, about 40% possess rifles, usually commandeered Springfields; but occasionally a Winchester or Sharps makes an appearance, as well as various revolvers. The only Black Ghost war society with origins outside the Shikshichela, the Crazy Dogs are an evolution of Cheyenne and Sioux wolf, dog, and coyote societies. Believing themselves possessed by canine spirits, Crazy Dogs fight with a suicidal bravery, but have taken an oath to forsake the use of white technology. Deriving their ironic name from the Sioux slang for Agency police officers, the Cheshká Máza adorn themselves with apparel and ornamentation taken from slain white enemies. Having sworn an oath to care for the Shikshichela sick or hungry, the Cheshká Máza match their uncompromising hatred of whites and Indian “turncoats” with an astonishing generosity toward their Shikshichela brothers. The elite troops of the Black Ghost Nation, the feared Rattlesnake Warriors fight silently in battle using poisoned weapons. They are renowned for their horsemanship, and maintain a fierce bond with their animals. Commanded by Immookalee, these female warriors fling themselves into battle with the ferocity of Amazons. Their name is derived from their Sun Dance ritual, which involves tethering skulls to their flesh with bone hooks. The most mysterious of the war societies, the fearsome Black Spiral Dancers are reputed to be shape-changing wolves and coyotes, and are known for entering a berserk trance during battle. A woman’s society composed entirely of widows, the “Black Left Hand” society are charged with securing, mutilating, and/or finishing off wounded enemies. They mark their deeds by leaving a black handprint across each victim’s face. Formed by middle-aged veterans who have demonstrated bravery in battle, the “White Bow Carriers” are known for their white headdresses and white bows. They are primarily responsible for tribal welfare, and serve the Shikshichela as a cross between an Oddfellows Society and an informal police force. They are also responsible for coordinating the motions of camps, finding winter quarters, and leading buffalo hunts. The Black Ghost Nation has only recently made itself publicly known, and is in the process of exploring wider alliances. Chief Snake Biting Hawk is quite impressed with Sitting Bull and Crazy Horse, and fully supports the rebellion of the Plains Indians. Having said that, he worries that the Hunkpapa wichásha is essentially a “decent” man, and may have trouble accepting the “strong medicine” required to actually win the war. Snake Biting Hawk hopes that the two chiefs may come to an understanding during the Great Sun Dance, and perhaps even form a meaningful alliance. Chief Snake Biting Hawk respects the visions of Wodziwob, but sees the Black Ghost Nation as a more focused and capable incarnation of the Ghost Dance movement. Indeed, some of the most recent Shikshichela are actually Southwestern Ghost Dancers who have become impatient with Wodziwob’s increasingly peaceful sermons. Although the followers of the Old Ways are to be treated with respect, the Black Ghost Nation takes the view of the Apaches and Sitting Bull’s “free” Lakota. Bows and arrows are quite effective—but guns are pretty useful, too. The Black Ghost Nation is loosely allied with La Corona, conducting negotiations through the Spanish-speaking Chetánnaghi. Although they are clearly walking the same path, Snake Biting Hawk is less certain they share a common destination, and believes that El Coronel and his brujos have become drunk on their own power. He is also disturbed by their apocalyptic spiritual beliefs, and worries that a world under the Sixth Sun will simply replace the white man with the brown man. Still, for the time being, La Corona are useful allies, and their intelligence is always reliable. The Black Ghost Nation and El Corona del Sexto Sol are my own creations, while the Raven Cult and their apocalyptic visions are part of the official Deadlands milieu. The Ghost Dancers sourcebook was particularly helpful to flesh out the ideas of the Raven Cult. Of course, Wodziwob is historical. Most of the supernatural beings detailed here have origins in actual Indian legends, including the wínyan núpa and the water monster of Alkali Lake. The Crazy Dogs and the White Bow Carriers are loosely modeled on historical Lakota war societies. The fictional Black Spiral Dancers are from Werewolf: The Apocalypse, part of White Wolf’s “World of Darkness” gaming milieu, and played a role in my former “New York By Night” campaign for Vampire: The Masquerade. The image used in the title banner was adapted from the movie The Darkness, which was not half-bad; which also means it was only half-good. Their notions about the Anasazi took more liberties than my own crackpot ideas; but at least I tried to remain anchored in some basic stratum of factual history. Anyway, the image was amazingly cool, so I borrowed it. The central image was adapted from a photograph of a Seneca found on the America Indian’s History blog. As to the Lakota language, I am greatly indebted to the Lakota Language Consortium, whose Lakota 1.0 software has been a tremendous resource for my Deadlands campaign. This is simply one of the best dictionary programs one could wish for, and it’s helped me considerably with this beautiful but difficult language. Many of the Lakota or Cheyenne names found in this section are authentic, however I made a few occasional creative leaps of faith, particularly with “Wahínkpéiléya,” “Zuzécha Chetányakhtáka,” and “Wichákhpi Okhíchamina.” If any gamer reading this has fluency in Lakota, please feel free to email me corrections or suggestions! The author writes for a horror game, and makes no pretense at being a Native American anthropologist or a Western historian. No offense or disrespect to the Lakota or Cheyenne people is intended, who are more accurately—and historically—depicted by Sitting Bull and his Plains Confederation as described in the “Deadlands Organizations—Sioux Nation” section. Additionally, any potentially offended reader is encouraged to note that my Deadlands campaign treats the U.S. government as an inherently destructive force, engaged in a genocidal war against the continent’s indigenous people in the mad pursuit of Manifest Destiny. In the world of Deadlands 1876, there are few heroes or innocent victims; only shifting power relationships between morally compromised human beings. Oh, and some dark gods waiting to plunge the world into chaos…!